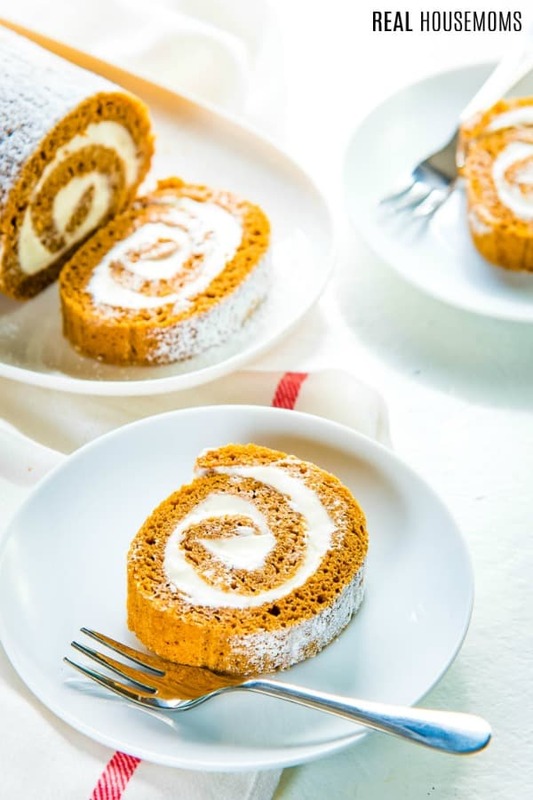 This Classic Pumpkin Roll is delicious, impressive, easy and certainly a must for the holidays but perfect for all year around! Who doesn’t love pumpkin in the Fall? 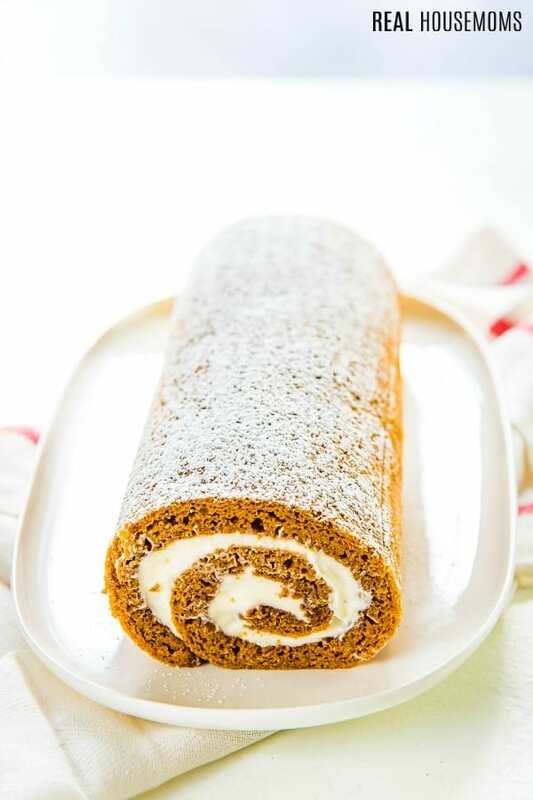 I could happily have pumpkin all year and with this Classic Pumpkin Roll recipe, it becomes a staple dessert for whenever you need it; not to mention the fact that it is so easy to make and so delicious. It’s guaranteed you will be making it over and over again. An impressive and simple dessert, pair it with my favorite Apple Cobbler and you have perfect after dinner treats for the holidays! 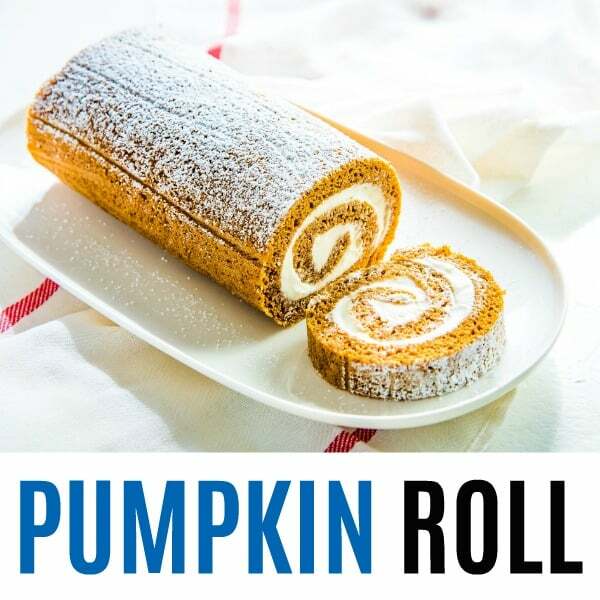 A quintessential Fall dessert I love to make is this Classic Pumpkin Roll! I know roll cakes sometimes get a bad rep for being finicky to make, but not this recipe. 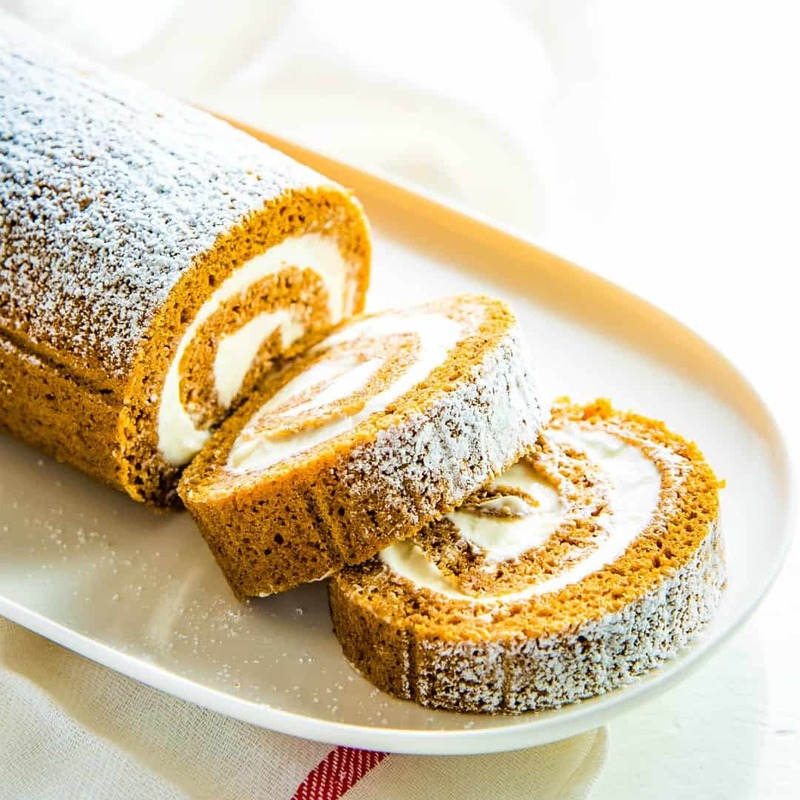 This classic pumpkin roll cake is easy and quick, even for first-time bakers. So don’t fear roll cakes, because I’ll be sharing tips on how to make the perfect roll with no cracks! At our house we start getting our pumpkin fix well before the leaves start to turn color, beginning our mornings with this delicious overnight pumpkin pie chia pudding parfait. This recipe is made with canned pumpkin puree. Make sure to buy the canned pumpkin puree, and NOT the canned pumpkin pie filling. I also used a mixture of brown sugar and white sugar for this recipe. Sugar keeps baked goods moist and soft. Brown sugar has a high moisture content and a deeper flavor. So adding both sugars helps keep the pumpkin roll moist and soft, but also adds more flavor than just adding white sugar. The first step is to whisk: eggs and sugar together until they are mixed well and a mixture is a little frothy no need for an electric mixer just a hand-held whisk will do. Pumpkin rolls rely on baking soda to rise, but the air incorporated in this whisking step will also help give the roll cake a nice lift. Once the wet ingredients are mixed together, add the sifted dry ingredients and mix through just like that the batter is ready! This recipe is just as easy and delicious to make as this crustless pumpkin pie, you’ll have no excuse to skip it. A jelly roll pan is best. The standard size of this pan is 10 x 15 inches, with 1 inch high sides. These pans are larger than a quarter sheet pan and smaller than half sheet pans. Prep the baking pan using parchment paper, making sure there’s an overhang of parchment paper on the two long sides. This makes it easy to remove the cake from the pan when it’s done. Use the right sized pan. A pan that’s too large, the cake layer will be too thin, too small and the cake will be too thick. This can create cracks (especially if the cake is too thin). Roll up the cake WHILE IT’S HOT! If the cake was baked on parchment paper, keep the cake on the parchment paper. If it wasn’t, transfer the cake onto parchment paper. Roll it up as evenly as possible while it’s hot. Use a cloth napkin to help roll the cake since the cake will be a little too hot to handle at the beginning. DO NOT PEEL OFF THE PARCHMENT PAPER. Roll up the pumpkin roll IN the parchment paper, this will help prevent the cake from sticking to itself as it cools. When the cake has cooled down, wrap it in the cloth napkin so that the pumpkin roll will keep its shape as it cools. Keep the cooling (rolled) cake, on a wire rack. The cake is going to build up moisture as it cools down, keeping the cake wrapped in cloth, as a result, this will allow air circulation that will prevent the excess moisture as well as turning soggy. Keep the cake rolled up until it’s completely cooled down. Even overnight. 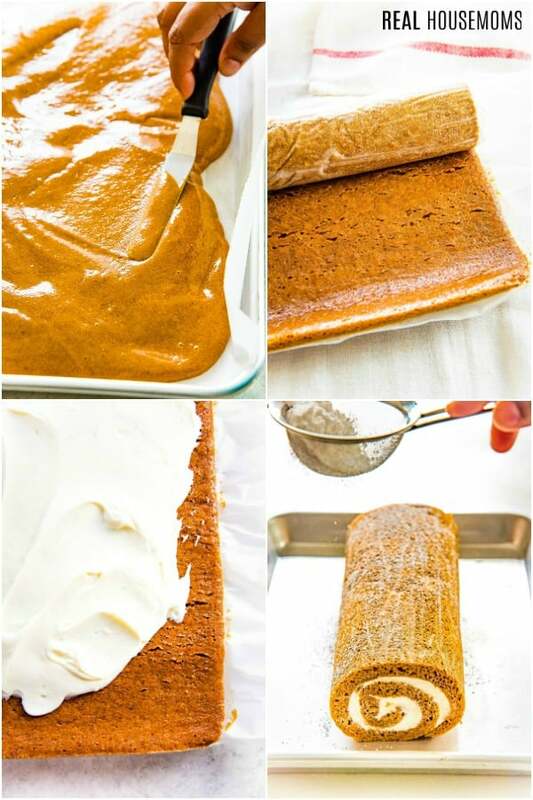 Follow these simple tips, and you will have the perfect pumpkin roll cakes and no cracks! The frosting comes together quickly as well. Make sure the cream cheese is at room temperature (about 70 °F), and not too soft. If the cream cheese is too soft, the frosting will end up being a little too runny. If this happens, it can be fixed by keeping the frosting in the fridge for a bit, until it chills a little. Jelly Roll Cake Pan – This is the jelly roll cake pan that I use to make Swiss roll cakes. It’s a standard sized jelly roll cake pan, and if you buy a rack for it, it can be used for other grilling and baking needs too (like chicken wings!). Whisks – A good set of whisks is always handy in any kitchen. I like to keep different sizes that are ideal for different tasks in the kitchen. Spatula set – If you love baking, spatulas are a must. I love this set I got, which I use almost every day. Parchment Paper – Your baked goods will never stick again! I love using parchment paper for everything from cookies to pizzas! Preheat the oven to 350°F. Line a jelly roll pan (10 x 15 inch) with parchment paper. Use butter to make sure the parchment sticks to the jelly roll pan. Make sure that there is about a 2-inch overhang over the cake pan, as well as the long edge of the pan. Do not butter the parchment paper itself, set aside until ready to use. Sift the baking soda and flour together into a bowl. Set aside. In a larger bowl, whisk the eggs, brown sugar, white sugar, and salt together until frothy. Stir in the pumpkin puree, vanilla, cinnamon, cloves, and nutmeg until nice and smooth. Add the flour and baking soda mix and stir until the batter is smooth. Evenly spread the batter in the prepared jelly roll pan. Bake the cake in the oven for about 15 minutes until the cake is cooked through. A toothpick inserted into the cake layer should come clean when it’s done. Remove the cake pan from the oven. While the cake is hot, lift up the parchment paper (with the cake), and place it on a flat surface that’s heat-proof. Carefully roll up the cake, starting from one of the short ends. Make sure you roll up the cake WITH the parchment paper - this will prevent the cake from sticking to itself. Wrap the rolled up cake with a cloth napkin and set aside on a wire rack to cool completely. While the cake is cooling, make the frosting. OR you can allow the cake to cool overnight (wrapped in a cloth napkin), and make the frosting the following day. Place the room temperature cream cheese, butter, and salt in a bowl. Whisk until nice and smooth and creamy. Add the confectioner’s sugar and vanilla and whisk until the frosting is creamy and smooth. If the frosting is too runny, refrigerate for a few minutes to chill. When the cake has completely cooled, remove the cloth napkin from the rolled up cake, and unroll the cake very carefully. Remove the parchment paper and place the cake on a tray or clean flat surface. Apply an even layer of the cream cheese frosting on the inside surface of the cake, leaving about a 1-inch border at the end. The thickness of the frosting level should be less than the height of the cake (about ½ of the thickness). Carefully roll up the cake again, making sure it rolls up evenly and not too tightly. Place the cake on a serving tray or platter, with the seam side down. Refrigerate for at least 1 - 2 hours. Dust the surface of the cake with extra confectioner’s sugar and cut into ½ inch thick slices and serve. I love to share recipes on my blog that bring together different flavors, textures and food cultures in new and creative ways. I especially love breakfast, brunch, and desserts of any kind, and will talk about it all day with anyone willing to listen.